Now there’s help quickly identifying the right LVDT Linear Position Sensor for an application. 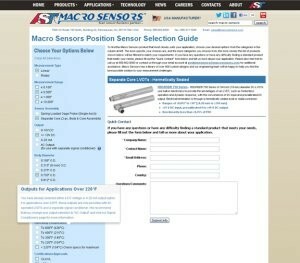 Replacing the need for customers to peruse numerous web pages and review product specifications, Macro Sensors offers an online Position Sensor Guide that quickly identifies the right LVDT Linear Position Sensor for an application based on desired options such as measurement range, output, body diameter, operating temperature and other specs. Using selection criteria, the Position Sensor Guide filters through hundreds of sensor options to provide a short list of suggested LVDTs that meet specific specifications. The more sensor specification options chosen, the more closely the Position Sensor Guide can narrow down selection to the right standard LVDT Linear Position Sensor that matches customer requirements. The Position Selection Guide even considers certifications and approvals as well as the LVDT’s ability to operate in different environments such as ambient/atmospheric pressure, high pressures and subsea submersion. Users having questions or any difficulty finding a LVDT Linear Position Sensor that meets specific needs can complete a "Quick Contact" form located at the bottom of the guide. Macro Sensors has a library of over 800 custom designs and an engineering team qualified to identify the best possible solution to linear and rotary measurement challenges.